For over 100 years, Chrysler has been considered an innovator for excellent automotive practice. Chrysler values American ingenuity, and has long been considered a trailblazer in the vehicular world, one that manages to prioritize both luxury and the family. Not only did Chrysler invent the minivan in the 1980s, but they have now built more than 14 million of them, each redefined with all-new architecture, quieter cabins, new safety features, and even the first Hybrid option! 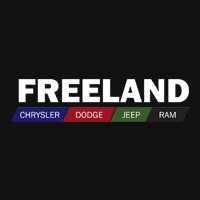 Freeland Chrysler, At Your Service! No one knows Chrysler like we do. That’s why our dedicated and certified Service Advisors are your best bet for superior, top-of-the-line servicing. Trust the experts with your baby…we’ll make sure she’s running better than ever before when we’re through! We’ll treat your vehicle like it’s one of our own, and at a reasonable price point too!